Greetings beloved one, I Archangel Michael am here. I say to you now, indeed you have the potential and ability to create the changes, and shifts in the world and your life that you seek. But understand, doing so requires the relinquishing of that which you have experienced in the past. For it is your culmination of experience, thought, belief, intention, and action that creates your personality and personal energy signature in the moment. And this energetic signature, or tone, is what creates your present and future experience. Therefore to create a new result in your life and in the collective… You must be willing to change not only your action but also who you are. Changing who you are does not mean moving away from your authenticity by any means. Rather you are being called to free yourself from the illusion of who you think you are, but in actuality, this perception is far less, outdated, and limited in scope from that which is the truth. Your choice in the moment is to remain confined within the illusion which feels safe, which feels like the truth of your identity, but which in reality is a tiny speck of the vast multidimensional being which is your authenticity. So you can witness firsthand and reveal the greater truth of the light and vastness of your multidimensional self. It is as if you’ve been viewing who you are through a pin hole camera, and are now being given the opportunity to upgrade to a window… But you have to let go of the pin hole camera first. Are you willing to let go of the illusion which feels safe but that in reality only limits you from your full truth and potential? Change both happens in an instant, and change is always happening. But to truly call forth the level of change in which you can quite literally transform your life, there must be the willingness to release. To release the very foundations of belief which are tying you to the limited scope of your existence. To release the core and outdated beliefs triggering the aging of your vessel, the stress of your mind, and the tension and struggle within the collective field of which you are a part of. Of course, there are many layers and dimensions to the illusion present in this realm. There is a complexity to the mask which has been pulled over the eyes of the collective… So much complexity that it seems real from your perspective. The illusion at times seems more real for those tied to it than the truth which seeks to set you free. But energetically, and according to Divine will, and supported by great waves of ascension light continuing to crash upon the shores of your real… The opportunity is here now for you to pull back the mask so you can finally let go of the limited view of who you are, to reveal the underlying truth that is vast. First for yourself. Like instructions, you may have seen for putting on an oxygen mask on a plane. You must secure your own mask before helping others. This is true in the reverse for freeing yourself from the constructs of illusion. Free your own heart and mind first… So you can then serve to free the hearts and minds of the collective. It is within this freedom that unity within the collective is felt. It is a result of this freedom of your hearts and minds that you are able to reunite with your full authenticity and truth as multidimensional beings, experiencing the play of consciousness not in HD… But through a multidimensional lens. Viewing existence as we in the angelic realms see… Beyond the limited constructs of the physical dimension wrapped tightly beneath the veil of illusion. And as you continue to tune into the light of your heart… As you integrate the higher levels of conscious light, allowing your very mind and heart to expand you are able to bust through the energetic constraints which have quite literally chained humanity to a wall for eons. Radiant love, light, awareness, sincere desire and willingness to transcend is the key to the lock. To lift through the glass ceiling. For when brilliant light shines into a place of darkness… The truth is always revealed. No longer can your truth be hidden, no longer can the wool remain pulled over your eyes. For you are the ascending initiate. You are here to ascend and awaken to the truth and remembering of your limitless nature. Accessing the vast stores of wisdom contained within your beautiful soul. This knowing brings the final burst of strength and renewal for you to push through. For the ascension process… The peeling back of belief, pain, density and limitation is not an easy journey. The very process of enlightening your being at times leaves you exhilarated and other times weighed down… For this reason, we encourage you ever in the present moment to return to balance. Retain your presence and awareness and remember that both the brilliant levels of light, peace and bliss… And also the heaviness, challenges, and emotions surfacing and feeling like anchors tied to your feet and pulling you underwater are essential. Whatever you are experiencing in the moment is your lesson and is your opportunity to progress on this ascension path of freedom. Feel, but do not be tied to what you are feeling. Observe but do not judge what you observe and see. Retain the knowing and certainty that all is well. You are well, and your every moment is the Ascension in action. The return of your highest level of solar light to you in the physical. There are many intricacies of what you may experience, call forth and manifest for yourself and humanity as a part of this experience. There is both Divine will and your free will intertwined. But understand this… You cannot choose a path of free will which is not allowed as a possibility within the scope of that which is Divine. And so trust in your ability to stay in alignment with the Divine intentions for your life and ascension. Be willing to break free from the molds of society, knowing that the complex illusion is part of what you are here to redefine and you do this through your beingness. Through the full reintegration of your Solar Christed Light. In this full integration, there is radiant joy, love, celebration and bliss… And you will experience these emotions on the journey. Just do not let yourself be trapped in the thinking that these positive experiences and high vibrational experiences are the only moments in which you are on track. For the simple truth is that dealing with challenges, healing wounds, and overcoming conditioning… Being in the trenches, looking at yourself with radical honesty, and healing the patterns, constructs, limitations, negative thought patterns, and delusions are not always enjoyable… But these too, along with basking in the light of the infinite are essential for your full healing… For your complete ascension. Walking in balance is the key now. Facing and looking square in the eye all that you encounter. For the very things you want to bury, to run from, dissolve and hide are the things which hold the hidden eggs of inspiration upon which you access when you integrate the lesson held in every challenge, negative encounter, or pain. Integration is key. Dissolving the charged reaction and integrating the underlying lesson. To do this, transcending the auto-reactions of the ego is essential. Releasing the firmly embedded patterns of emotion repeating like a record and re-manifesting experiences in your life based on energies that have passed. We say to you directly and clearly now… Let go of what you think you know and be willing to enter into the unknown. It is within this direct experience with that which is unknown to you… That which is your full light, and multidimensional nature, and unity with the collective, with the Divine and with all that your fullness and truth, and innate wisdom can be accessed and returned. Balance, awareness, presence, and observation serve you greatly. As does one moment at a time anchoring a new pattern of love. Love made possible through surrendering ego, surrendering the past, surrendering the future and the present to enter inward… To expand around… To connect with the Divine and to lose yourself in this light of Divinity. Freed from the web of energetic manipulation and control. As you walk this path you can then act as a beacon and light for others. 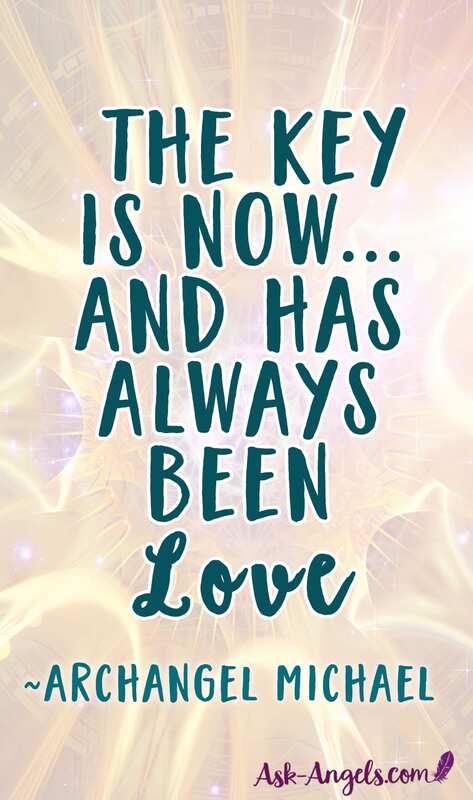 The key is now and has always been love. Love guides you through your integration. Love supports you through periods of challenge, “ascension symptoms”, and heavy emotions felt as you integrate and release. Love is the ultimate tool for renewal… And renewal here is key. The renewall that is made possible through connecting with the infinite. Go within. Open your heart. Quiet your mind. Relax and expand around. Expand into oneness with the Divine. In this… You are free. This path continues to unfold as you continue to progress. Exercise patience and persistence. We are with you. You are loved.